I've grown to really like KDE. Working with KDE is, in a word, fun. Yes, fun. Enjoyable. A pleasure to work with. Easy to approach. Provides pleasant surprises and wonderful answers to problems I never new I really had. That's why I keep posting about Suse and KDE, especially this release. I'm digging a little deeper into Konqueror. Konq has a tremendous flexibility missing in Nautilus. It can list files in any number of organized ways, allow for viewing images (JPG, GIF, PNG, etc) as a slide show, even open up RPM files for viewing of their contents and then allow them to be installed via YaST. It's a powerful, rich, polished Swiss-army-knife of an application. 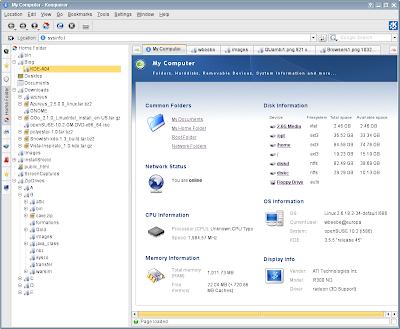 When Konq is first opened by clicking the "My Computer" icon on the desktop, it displays a cleanly organized synopsis of your system's resources, with links to some elements that can be further examined. It would be nice if every item presented had links to every application that could manipulate it; for example, clicking on the Display Info would bring up Sax2. But what is presented is quite adequate, and I'll wait patiently for future releases to see if additional functionality is added. One of the first features I discovered is that Konq has tabs. This, of course, is the result of the Tab Wars between Firefox and Microsoft's IE. For their own protection the Konq developers felt they had to have some too (joke). 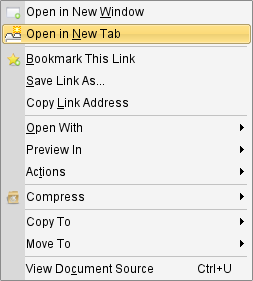 Tabs are simple to open; simply right-click on any folder (or just about anything else, for that matter) to bring up the properties menu (see below) and click "Open in New Tab". I don't know when tabs first showed up in Konq, but the ability to have multiple tabs with multiple file views into multiple areas is a feature I never knew I missed until I found it here. You can even split a tab, horizontally or vertically, to view different directory structures. The ability to drag-and-drop or simply compare (visually) between the two is obvious. 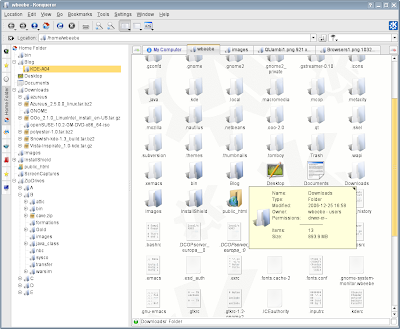 The view above is in my home directory, with hidden files shown. 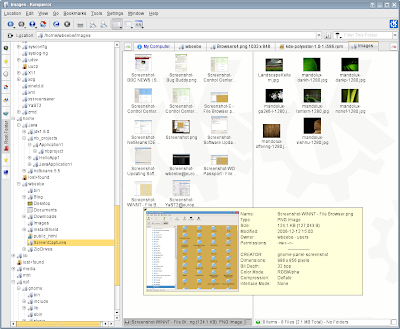 The icons come from Vista Inspirat. Those icons, coupled with the Polyester widget set and the Keramik White color theme make my desktop quite pleasurable to use, at least to my personal tastes. As usual, your mileage will vary. The icons and widget set came from another article by Thom Holwerda and OSNews. 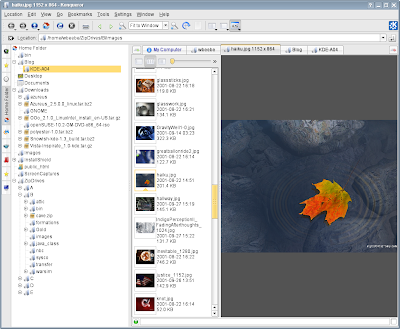 Once again I'm looking at pretty pictures using the Image View, available from the control bar. No hunting through menus or another application. It's Just There and It Just Works. Here, on yet another tab, I've clicked an RPM file (the file that contains the Polyester widget set). Konq not only gives me the RPM's details, but presents a button that conveniently allows me to launch YaST and install the RPM if I so desire. Sweet. Finally, I've got a split view between two different directories. I could move files about between the two area. The cursor hover provides excellent detail when over a given file, such as this image file. I get a more-detailed view of the image as well as information about the file. This view, as well as all of Konq, is a very usable, quite powerful, and a real pleasure to work with. What about using Konq as a web browser? 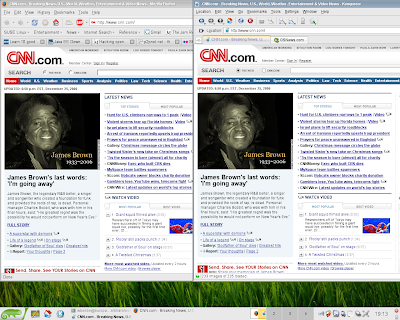 Take a look at the side-by-side comparison above of Firefox and Konq; Firefox 2 is on the left and Konq is on the right. Both are showing CNN's home page. I can't tell the difference between the two as far as page rendering is concerned. 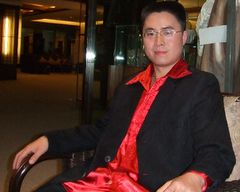 For straight-forward HTML and web graphics, both show excellent and equal quality. 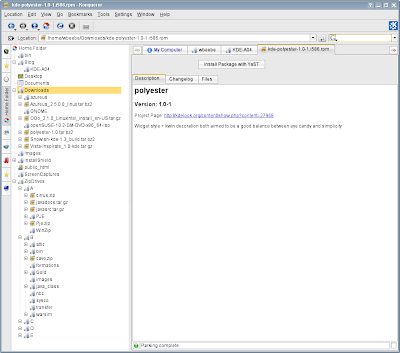 The problem with Konq, however, is with AJAX applications. For example, I opened up my Google mail account in Konq and got the following. 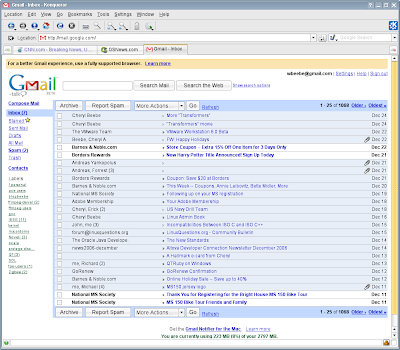 There's a big fat warning right across the top: "For a better Gmail experience, use a fully supported browser." That's why I'll stick with Firefox for most needs. And that's a shame, really, because I believe that Konq should be supported. Maybe it is, and I just need to tweak Konq to identify itself as some other browser that is fully supported. Time will tell.